Water proofing services have been great. I think in the last 8 years I have been doing business with you I have had 0% call backs. Workmanship has been great. All personnel that I have been in contact with on my job sites have always worked in a professional manner. Your capability to make our schedule has been great." Renaissance's knowledge of products and attention to detail let me concentrate on building a house and not worrying about whether or not the water proofing will work." Your expertise…has proven invaluable in the procurement/execution of our multifamily/commercial projects. Your means, methods and consulting have reduced our exposure and provided our clients with the security they demand... Your crews are always on task, and on schedule. Your orthodoxy to our schedules removes guesswork, while your flexibility in scheduling makes you responsive to the rapidly changing demands of our projects. You have been the best waterproofing consultant/sub-contractor. It is for this reason that you will be our exclusive consultant/sub-contractor on our future projects. A great group of guys who are always the solution and never the problem. Great team players!" Brookstone Builders have worked closely with Ken and George Barnes on numerous challenging and dynamic projects to ensure the best and most economical solutions for our clients. Ken and George continue to be timely and professional in their respective disciplines of work." Having worked with Renaissance Stone Care & Waterproofing for more than 10 years I find them to be a detail minded and knowledgeable company that is flexible and easy to work with. From water proofing 10,000 square foot basements to detailing the finest of marble, their work is impeccable and they stand behind their warranty." Adorno Construction, Inc. has found working with Renaissance Stone Care & Waterproofing over the last ten years to be one of the top contractors in this field. They are always responsive to our needs, timely and efficient, and the quality of their work is top notch." Renaissance Stone Care & Waterproofing is at the forefront of technology which provides piece of mind as well as reliability to get their work done expeditiously. They are the "Go To" company for Stone Care & Waterproofing." The Conrado Company, Custom Home Builders has worked with Renaissance Stone Care & Waterproofing since 2001. 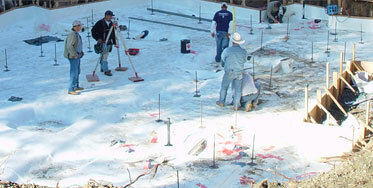 They have provided our projects and clients with professional waterproofing services that we can count on. Water is a builders biggest nightmare, and George and his staff’s work allows us to sleep at night." Our company and I have used Renaissance Stone Care & Waterproofing almost exclusively for the last 15 years as a Waterproofing contractor/consultant as well as for restoration of stone and masonry surfaces. My experience with Renaissance has always been positive, especially in situations where architectural specification and direction is less than complete. They have shown a broad range of knowledge in waterproofing a multitude of materials, and have been able to troubleshoot and repair existing problems. Renaissance has been a constant in a field of evolving sub-contractors." In my experience Renaissance is the most thorough, courteous, trustworthy, and reliable subcontractor I have ever employed. They do what they say they will without mistakes." Scott and Warner Builders, Inc.